Researchers at the European Bioinformatics Institute (EMBL-EBI) and the Babraham Institute in Cambridge have identified an accurate mouse epigenetic clock that uses DNA methylation to accurately estimate an animal’s age. The paper, published in Genome Biology, confirmed that lifestyle interventions known to shorten lifespan also accelerated the clock. The mouse epigenetic clock could become a useful tool for understanding how ageing works and what interventions can accelerate or delay the process. DNA methylation is a process that alters how DNA is read and expressed without changing the underlying DNA sequence. In 2013, research (Horvath S.) identified that DNA methylation changes that take place at distinct sites in the human genome can predict the chronological and biological age of an individual. Biological age is a measure of how well your body functions compared to your chronological age, which expresses how old you are. The human epigenetic clock proposed by Horvath can use any tissue or fluid in the body to predict age, with an error span of +/- 3.6 years. This is by far the best biomarker of age available. However, it is unclear whether DNA methylation changes cause the ageing process or are a consequence of it. To better understand how the epigenetic clock works in humans, the current study unveils a mouse epigenetic clock. The current paper shows that changes in DNA methylation at 329 sites in the genome can predict a mouse’s age with an accuracy of +/- 3.3 weeks. Considering that humans live to approximately 85 years and mice to three years, the accuracy of the mouse and human clocks (better than 5%) are surprisingly similar. Using the mouse model, researchers also showed that lifestyle interventions known to shorten lifespan sped up the clock. For example, removing the ovaries in female mice accelerates the clock. Interestingly, a high fat diet, which we know is detrimental to human health, also accelerates the mouse ageing clock. Remarkably, researchers were able to detect changes to the epigenetic clock in mice as young as three weeks old, which could accelerate future research into ageing. “Dissecting the mechanism of this mouse epigenetic ageing clock will yield valuable insights into the ageing process and how it can be manipulated in a human setting to improve health span,” adds Marc Jan Bonder, Postdoctoral Researcher at EMBL-EBI. Further study will allow scientists to understand the inner mechanistic workings of such a clock and change its ticking rate in the mouse model. This will reveal whether the clock is causally involved in ageing, or whether it is a read-out of other underlying physiological processes. These studies will also suggest approaches to wind the ageing clock back to rejuvenate tissues or even a whole organism. An epigenetic clock is a type of DNA clock or map based on measuring DNA methylation levels in different sites across the genome. DNA methylation is a process by which methyl groups are added to the DNA molecule. This can modify the function of the genes without changing the underlying DNA sequence. DNA methylation is essential for the healthy growth and development of cells. The epigenetic clock can be a tool for estimate the biological age of a tissue, cell type or organ. The most well-known example is Horvath’s epigenetic clock, publicised in a 2013 paper in Genome Biology. By comparing DNA methylation age (biological age) with chronological age, scientists can gain insights into how ageing works. They can also understand what influences the speed of the process and find links between ageing and disease. 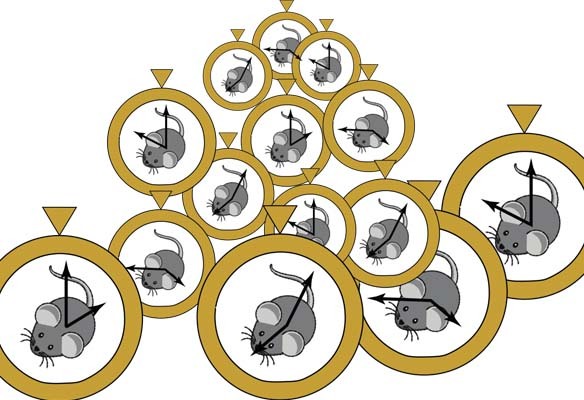 Scientists could use the mouse epigenetic clock to understand the biology of ageing.